Now, depending on your budget, the city has a wide variety of accommodations ranging from inexpensive lodging houses to luxury five-star resorts. However, if you want to experience the real Amsterdam in all her urban glory, we suggest you take a trip to the Yays Crane Apartment – a refurbished 1950s crane restored and later converted to a high-end sophisticated living space sometime in 2017. Yays Crane is situated in the crane’s original location of the Eastern Docklands offering a stellar view of the IJ River flowing alongside. The place is open all-year round and is a popular vacationing spot for young couples and solo travelers alike. Read on to know more about this fascinating hotel and the reasons why it should be on your bucket list this holiday season. 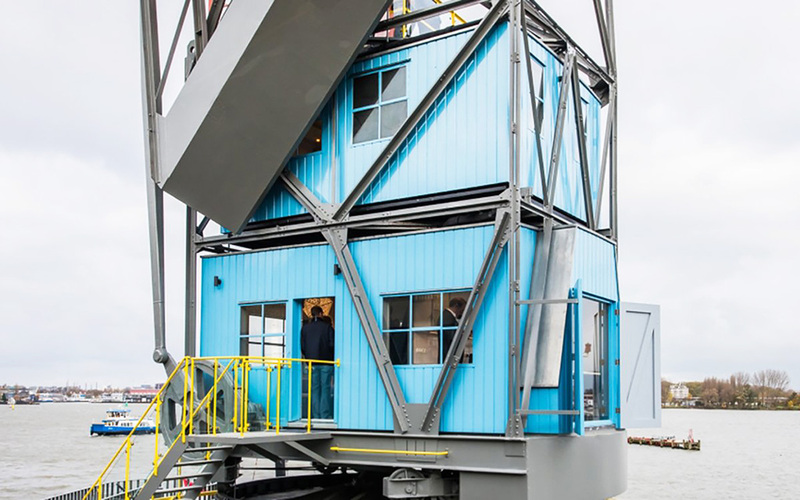 Ever dreamed of sleeping in a crane that’s set high above the ground amidst the ships and the sea? The Yays Crane Apartments in Amsterdam gives you a first-hand experience of what it would feel like to live in a crane. Don’t worry, you’ll be pretty comfortable inside. The crane, now renovated into a three-story living space, looks more like a luxury apartment than a hotel. It is the ultimate experience for people interested in history and architecture. The hotel is set in the Eastern section of Amsterdam, which was the epicenter of trade in the 19th century. Even today, the harbor attracts a lot of international trade from neighboring and distant countries like Thailand, Malaysia, and America. Yays Apartment feels like a trip back in time when things were a lot simpler and peaceful. It takes you far away from the din of the main city and yet offers all the possible luxuries you’d expect of a five-star resort. Yays has a very interesting story behind its construction. The looming, magnificent structure you see today was but a crane back in 1957. On 21st November 1944, a German Sprengcommando attacked and destroyed the cranes harbored along the IJ River in Amsterdam. 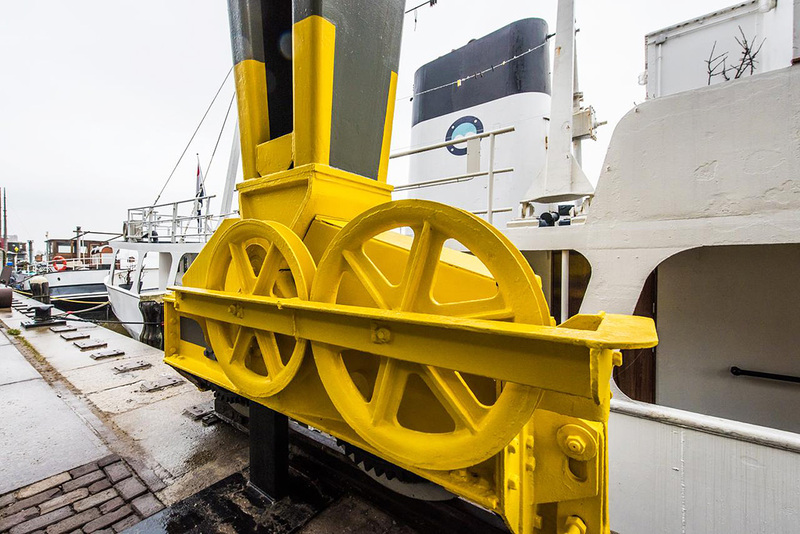 After the Second World War, the Royal Dutch Steamboat Company, KNSM, was commissioned to construct new cranes that served to facilitate trade relations between Amsterdam and the rest of the world. KNSM ceased their activities in 1979. Ever since then the Eastern Docklands were reduced to a strip of grassy pathways, railroads, and warehouses. Sometime in 1975, the municipality decided to finally demolish all the deteriorating cranes and turn the abandoned docks into a residential space. They spared one crane, a 2868 Figeecrane, built in 1958, that was located at the Surinamekade on KNSM-Island. The restoration of the crane was initiated by a local resident in partnership withYaysConcierge Boutique Apartments, the Conservation of Historic Buildings and Sites and the municipality. 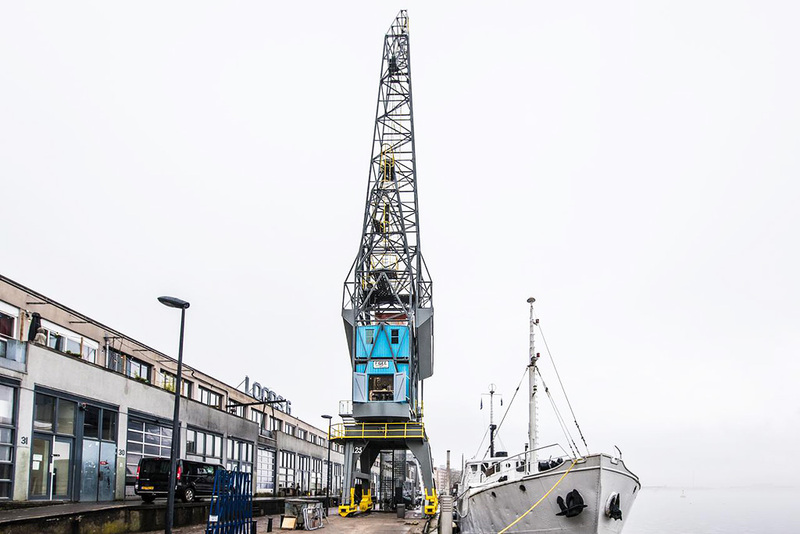 And in January 2016, the crane was refurbished by an Amsterdam-based architect and interior designer Edward van Vliet. He transformed the crane into the modern, chic apartment we see today. The architecture of Yays Crane is the fascinating aspect of the hotel. Not because of its rich history and heritage (of course, that plays a major part), but because of the wonderful contradictions, it poses. Rising 50 meters from the ground, the 40m2 apartment is designed as three repurposed containers that are stacked on top of one another to form a quirky and solid structure. The tall, magnificent crane looms in stark contrast with the background of the dockyard, yet it somehow seems to belong there. The basic design of the crane is deliberately kept untouched and close to its original design to provide authenticity to the hotel. Guests can get a feel of the crane’s history and enjoy the comforts of a luxury hotel at the same time. Yays Crane features a huge metallic and plastic construction, the actual living quarters are set on the lower side of the crane. The bright blue wooden cabin of sorts set on an elevated platform. Guests can access the rooms indoors via a sturdy industrial-grade staircase outside. The apartment is divided into three floors and can house a maximum of four people at a time. The living room and kitchen are set on the first floor. There are two bedrooms and a spacious bathroom set on the two floors above. The entire structure overlooks the IJ River and offers a stunning view of the Amsterdam skyline. The exterior architecture of Yays Crane is at complete odds with what you’d find inside. While on the outside, the hotel looks like a quirky metallic crane; on the inside it resembles a modern apartment. There are two bedrooms, a bathroom, a living room and kitchenette along with a small patio and open terrace on the top floors of the hotel. The kitchen and guest room are situated on the first floor while the bedrooms are housed on the higher levels. The rooms are all thoughtfully furnished and decorated in neutral shades. The living room includes a comfy couch, a coffee table, lounge chairs and a flat-screen TV. There’s a mahogany dining table for four set right beside the floor-to-ceiling glass windows. The kitchen is equipped with all the high-tech amenities like a refrigerator, an oven, cooker, dishwasher and plenty of utensils for a comfortable stay. The master bedroom on the second floor comes with a queen-sized double bed, loads of pillows and a side table. The second bedroom is located on the topmost floor and opens up to a small patio that overlooks the harbor. The bathroom is on the second floor, however, there is a small toilet attached to the bedroom on the third floor as well. The vibrant city of Amsterdam is peppered with intricate canals and breath-taking architecture. You’d find a museum or an artistic coffee shop in almost every corner! Yays Crane Apartment though set on the Eastern side is well-connected to the main city via roadways and railroads. It is 2.7kms from the Central Station and roughly 3.1kms fromBeurs van Berlage. You can either choose to stay indoors and bask in the solitude of the apartment or head out to explore the city. When indoors, you are completely left to your own devices, there aren’t any staff or housekeeping to assist you. Sleep in, watch movies, cuddle up with your partner or just enjoy the breath-taking view of the river through the glass windows. It is pure bliss inside! The more outgoing and adventurous guests can check out the numerous tourist attractions of the city. Amsterdam is a city for art lovers and the history buffs. The Rembrandtplein, the Flower Market is but a 30-minute drive from the hotel. Other popular landmarks include the Basilica of St. Nicholas, CarreTheater, Dam Square, Anne Frank House, and the Van Gough Museum – all an hour’s drive away. The millennial traveler doesn’t just want a cozy, homely lodging space. He is looking for an accommodation that is unique, luxurious and quirky. The Yays Crane apartments in Amsterdam pretty much fit the bill. It is one of those rare places where you can experience nature whilst being steeped in urban chic architecture. This holiday season; chuck the beachside resorts for a night inside a refurbished crane by the dockyard. 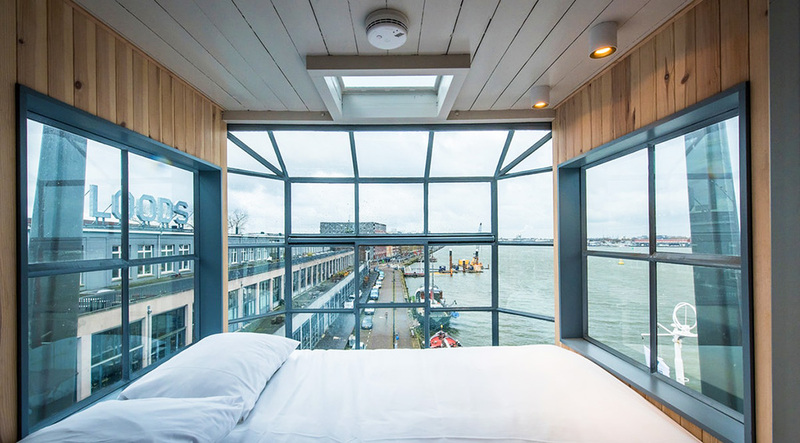 It will elevate your stay in Amsterdam – literally!